LocalOzarkian Photography – My travels with the camera along Route 66, the Ozarks, and the four state region of Arkansas, Kansas, Missouri, and Oklahoma. My travels with the camera along Route 66, the Ozarks, and the four state region of Arkansas, Kansas, Missouri, and Oklahoma. 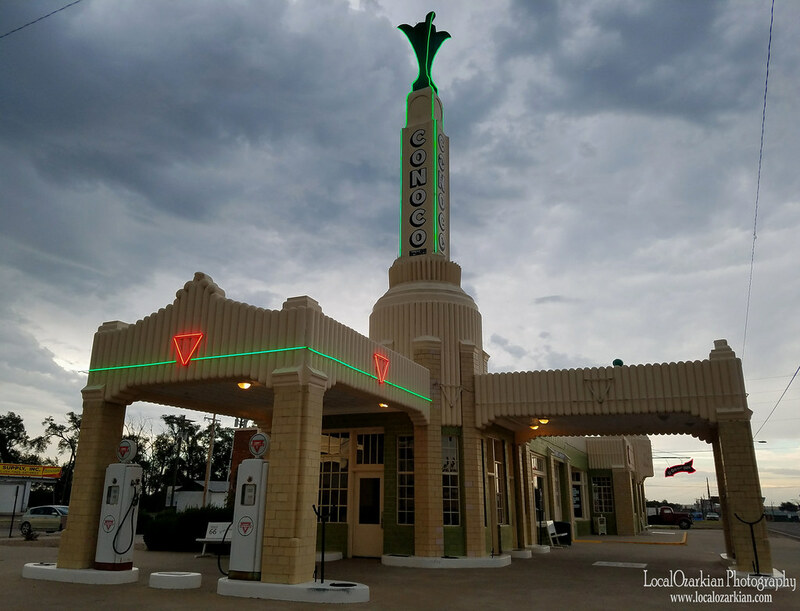 Three weeks ago, my wife and I took a weekend road trip along Route 66 from Springfield, Missouri, through Oklahoma to Shamrock, Texas. It wasn’t really planned out except for the booked hotel in Elk City, Oklahoma which is the way I like doing things. I enjoy road trips more when there is little planning to it like this one. We left Springfield at daybreak and headed West along I-44. Route 66 between Springfield and Tulsa is very well traveled by yours truly, and we wanted to hit a section we haven’t really driven much of, so we bypassed 66 to the other side of Tulsa. Once we passed Tulsa, we got off the interstate at Sapulpa, and got on 66 there. Our first stop was the Guardian of the Plains, a giant buffalo that was erected as part of the “Pride in Sapulpa” project celebrating the Oklahoma centennial. I’ve always been quite impressed with it every time we passed it driving along I-44, so to have the opportunity to snap a few photos and marvel at it up close made me happy. Just past Sapulpa is the Rock Creek Bridge, a beautiful, old, steel truss bridge with brick decking. I’ve never seen that before on a bridge. We spent about ten minutes taking pictures of the bridges, the scenery, and the butterflies that kept dive bombing us. Just up the road lies the abandoned Teepee Drive-In that was built on the outskirts of Sapulpa back in 1950. At full capacity, it could hold up to 400 cars for a evening movie. As we approach Stroud, I was really starting to get hungry and The Rock Cafe instantly popped in my head. As we pulled in at 11:30, it was busy with one parking spot available just for us. We walked in and fell in love with the place instantly. The signatures from past customers was all along both walls as you enter the dining area. The restaurant is decked out in 66 attire all along the cafe’s dining area that keeps your eyes busy as you sit and enjoy your meal. I got a burger and fries and thought it was delicious! My wife got the chili cheese fries and I was mooching off her plate until it was gone. Loved it. We definitely plan on coming back again the next time were in the area. We liked that the meal came with souvenir cups. From Stroud, we proceeded West until the 66 Bowl sign caught my eye in Chandler. The 66 Bowl sign once graced Route 66 in Oklahoma City, but has now been placed in Chandler, Oklahoma in front of the soon to be future sports and entertainment complex. I gotta say, it looks good. I would love to see it lit up at night. Just down the road is the Lincoln Motel and it’s fabulous sign. As we hit downtown, another gem had caught my eye. The old Phillips 66 station has been on my bucket list for many years now, so to be able to stop, photograph, and look around was a treat for me! The cottage styled gas station is in the process of being restored. Our next stop is just outside of Arcadia and is mostly just the wall ruins of an old Conoco filling station. It is thought to have been built in the late teens, early twenties. The story goes like this. But there’s an interesting story with it. Back in the days when Al Capone was terrorizing folks in Chicago, a so-called salesman came by the station offering to sell the owner a way to make a lot of money, a set of plates for counterfeiting $10 bills. The owner was convinced, and bought the plates. He built a small room behind the station in which to hide the printing materials and a place to work. The only entrance into the room was through the window you see on the back wall today. A solid wood covering was kept over the window and most customers never knew the room was back there. He would press one plate on a piece of paper with green ink and let it dry for 24 hours. Then, the next day, he would print the back side. One day, someone was caught passing one of the counterfeit bills. With identification in their pocket, they were traced back to the Luther area, and back to the station. The plates were found and the owner was taken to jail. On the edge of the Oklahoma City Metro lies Arcadia and the Round Barn. I’ve stopped at the barn numerous times in the past to photograph it, but had never been inside. I thought the museum was interesting, but I was amazed when I went up onto the upper floor. The ceiling instantly had caught my eye with it’s detailed frame work. It’s hard not to admire the architectural and engineering details this old barn holds. Built in 1898, this world renowned 66 icon has been restored, and is the only wooden round barn in Oklahoma. Definitely worth a stop and a little admiring. Our plan after the Round Barn was to stop at POPs, but the place was busy! Not a single parking spot available. So we made sure to stop there the next day on our way back home. We bypassed the OKC area completely and got back on Route 66 at El Reno, and proceeded West to the Pony Bridge near Bridgeport. Built in 1933, the Pony Bridge crosses the Canadian River at 3944 feet long and contains 38 Pony Trusses. Crossing the bridge is a little road trip in its self with its total length. It was quite a treat photographing the bridge and watching passing cars taking what seemed like an eternity to get from one side of the bridge to the other. I really wanted to stay longer, but it was starting to pour after being there for 10 minutes. Just down the highway is Lucille’s Service Station near Hydro. One of only two out thrust porch and live over style stations left on 66, the station is listed on the National Register of Historic Places. Built in 1929, Lucille Hamon, also known as the Mother of the Mother Road, ran the station for more than fifty years. After her passing, the station was restored. For some travelers who take 66 West, St. Louis is the beginning to the West since it is called “The Gateway to the West”. For others, the Oklahoma state line. or Texas state line. I always had felt that the West started on the West side of Oklahoma City. The land flattens out with less trees and more ranches. Oklahoma City on East just feels too much like home for me as the landscape is no different than in the Missouri Ozarks in most areas (Minus the really hilly terrain of the very Southern Missouri Ozarks). I always get excited once we hit the flat land of Western Oklahoma. The terrain is different than what I’m used to seeing all the time. 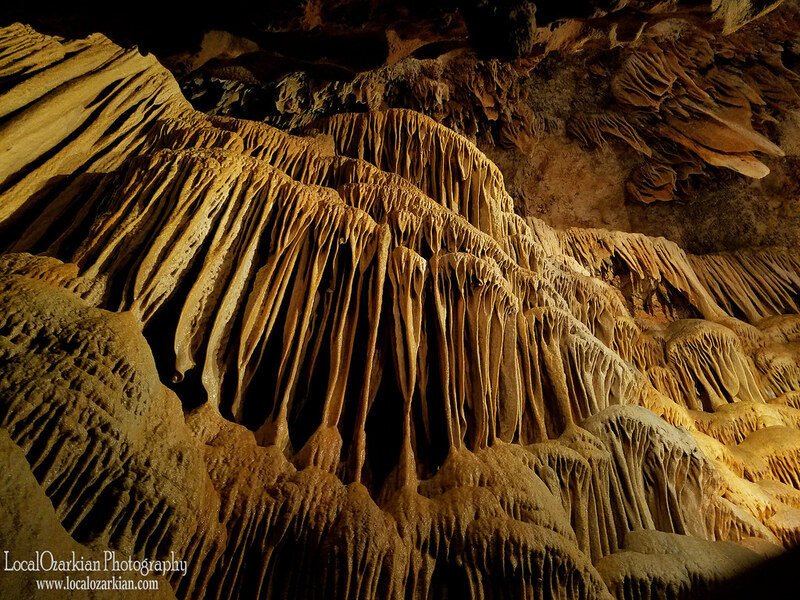 Three weeks ago, I took my dad and wife to a show cave in the Lake of the Ozarks area. Bridal Cave, a popular destination for tourists to stop at year round, or to get married in a cavern, is a cave I had not been to in over 10 years. Probably over 25 years for my dad since his last visit, and my wife had never been. It was a nice Sunday afternoon, and thought this would be the perfect place to go. No regrets. The cave was just as stunning as I had remembered it being from my last visit. As one of the most scenic caves in Missouri, let alone the United States, Bridal Cave has been the go to place for over 2000 couples to married in over the years, as well as a educational destination for thousands of school children for its Discovery Tour. With the tour lasting an hour, plus tour guides who are well informed and entertaining to boot, I highly recommend a stop at this Central Missouri show cave if you are ever in the Camdenton, Missouri area. 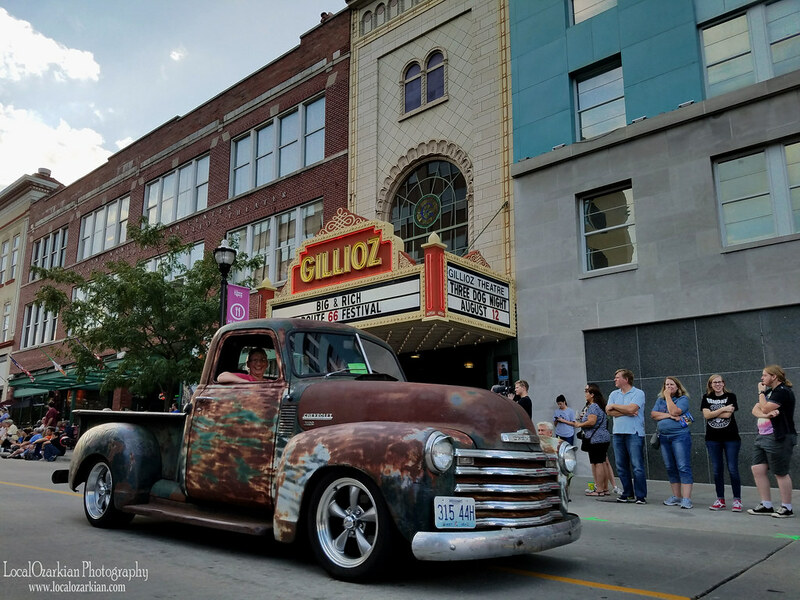 So, the pictures I took of the car parade during the Birthplace of Route 66 Festival in downtown Springfield, Missouri weeks ago are finally done and posted… Almost a month after the event. I used to be able to find the time to edit and post pictures I had taken that day, but real life events, plus lack of motivation lately has kept me from doing that. I’m hoping in the next few months to catch up on pictures I have yet to post in the last 12 months. There’s thousands of them folks. I hope you will enjoy them. Seriously. A little about this years festival. Around 50,000 people attended the weekend event back in August. A new record. Also, the weather was perfect. Not 100 degree heat like in the past festivals, but more like late April weather with temps in the upper 70s. The crowds during the festival was so packed up and down St. Louis street, that it made it really difficult to photograph the cars that were parked along the curb on both sides of the street. So this year, I didn’t photograph the car show, but rather just enjoyed looking at the cars instead. I was able to meet roadies I had never met during the festival and hopefully will keep in touch. All in all, it was a great weekend! After scrapping my original webpage a few months ago, I took a break from just about all projects related to my travels and photography except for a few photo edits here and there for my Instagram account. I think starting this page up in a blog form feels right for me now, and down the road. I’ll also be sharing photos via my Instagram and Flickr account of my road trips via links to my blog on this website. A little about myself. I’m a happily married 36 year old who lives in the heart of the Missouri Ozarks, just South of Springfield, Missouri. I spend my free time going on road trips with the camera in what ever direction I feel is right for the day. I’ve been taking pictures as a hobby since 2003, while exploring the Ozarks. I got into Route 66 back in 2010, and haven’t looked back. The Mother Road has become quite the passion of mine, so expect to see a lot of photos of 66 in the future. For those of you who has read everything up to this point, thank you, and welcome to my little corner of the world!